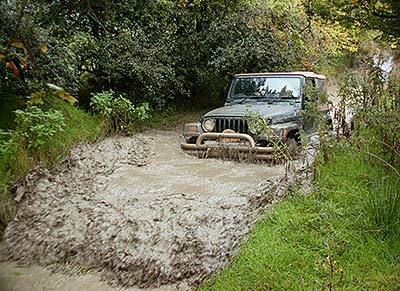 JeepClub™ was a UK-based organisation catering for the needs of owners and enthusiasts of Jeep® vehicles. It was founded in 1998 and closed after a near 14-year run in 2012. The club was originally formed as the Swain & Jones Jeep Club, named after a Chrysler Jeep franchised dealer located in Farnham, Surrey. It was conceived after a customer of the dealership struck up a friendship with a workshop technician, who together pitched the idea of a no-nonsense club for customers to the sales manager. Swain & Jones closed in November 2015, following Jaguar Land Rover's decision not to renew their franchise agreement. Ironically, Swain & Jones had been trading for 14 years longer than Jaguar themselves, having operated from their East Street site since 1908. The founding principle of the club was to offer experiences to help achieve the most from Jeep ownership, whether through off-road events or social gatherings, and to do so without the need for bureaucracy, committees or red tape. The club officially launched on the evening of the 6th August 1998. 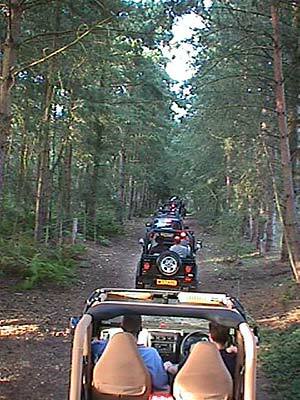 Wrangler customers had been invited to meet at the dealership at 7pm, before driving in convoy to Frensham Ponds where the group received some brief tuition on the nearby byways. From there, the group travelled to The Mill, Elstead, which was established as the base for the club's monthly meets. Cherokee and Grand Cherokee owners were invited to join a few months later. 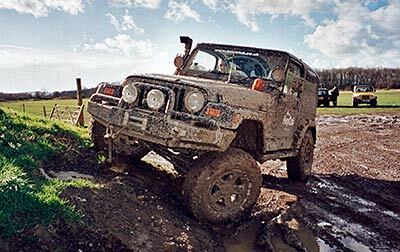 The club's first event took place on 27th September 1998 at the long-since closed High Frontier 4x4 site, near Salisbury. The site was operated by the charismatic American actor, Randall Paul, with obstacles throughout the site named within a 'wild west' theme - One-eyed Jack, Wampum, Thunder Cloud, etc. High Frontier closed in 2000. The woodland site is now a natural burial ground. 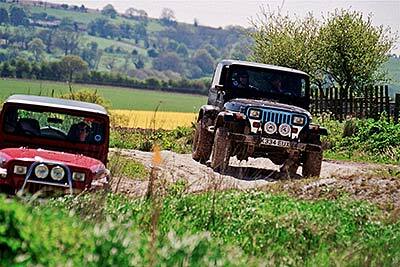 As the club grew and attracted members from other areas, it moved away from its Swain & Jones roots and adopted a new name - the All Fours Jeep Club - on 31st August 1999. On 9th September 1999, the domain jeepclub.co.uk was registered and the club gained the first of many purpose-built websites. The club benefitted from the enthusiasm and experience of a large number of its committed members, and this allowed it to punch above its weight in many areas. New sites were discovered such as the well-regarded Tuff Terrains in Llandrindod Wells, while tenacity afforded the club access to MOD land such as Broxhead Common, normally the preserve of much larger organisations. 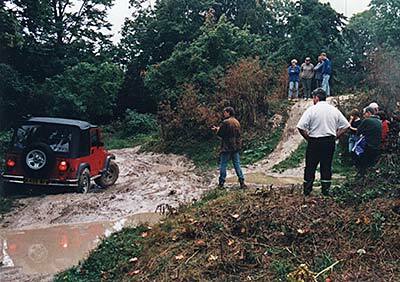 In 2000, the club held 19 events, including despatching a contingent to two international events - the European Jeepers Jamboree and the Parc de Marquenterre. The club also laid on training sessions for both new off-road drivers and the more advanced, and ran the first of its perennially sold-out archaeological Wessex Safaris. That same year, the club published its first newsletter (titled 'On All Fours'), launched a new 'secure area' on the website to automate event booking, and became affiliated with GLASS, the Green Lane Association, underlining the club's commitment to safe and responsible off-roading. Until this point, the club had been financed by the remaining founder, but with rising costs (particularly insurance) and the growing problem of no-shows and last-minute cancellations, a solution was sought. 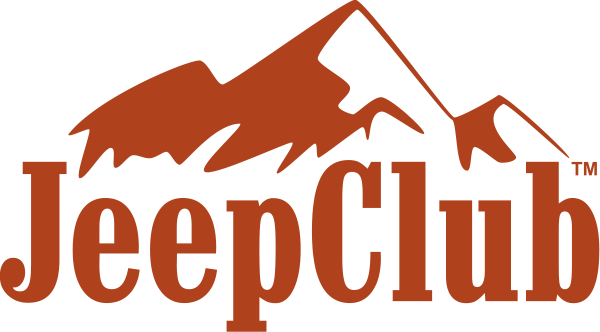 In September 2000, a £25 Voluntary Membership Contribution scheme was launched, followed in November by the arrival of the club's first sponsor - Callserve Communications. Honouring its commitment to represent value for money for its members, 2001 was the year of the expanding membership discount scheme; benefits included 10% discount with usa4x4, 15% discount with Adrian Flux insurance, 10% labour discount at EDM Jeep Specialists, 10% discount on tyres and wheels at Monty's, 10% discount with Powerbulbs, 12.5% discount on Haynes manuals, and 10% discount with Specialist Leisure and Jeep-Stuff. Unfortunately, 2001 was also the year of foot-and-mouth disease, and with large parts of the country operating under an exclusion zone, much of the first half of the club's calendar of events had to be cancelled. However, despite a four-month enforced break, the club still managed to run 16 events that year. Having helmed the club for almost four years, the remaining founder began to seek his independence from it. This started in November 2001 with the creation of the JeepClub Partnership - a formal legal structure that could offer reassurance to club officials from rising liability concerns - a new drive to establish a wider geographical spread of events, and the consolidation of the previous two-tier membership structure into a simpler £30 annual membership. With the future of JeepClub secured, the remaining original founder resigned from the club on 22nd April 2002. That year saw the club adopt LARA Associate Member status, introduce a new range of branded merchandise, and launch a new website with full online payment facilities. Twenty one events were held in 2002 at venues across the country, from Fife in Scotland to the Forest of Dean in Gloucestershire, ranging in nature from newbie training to advanced rock-crawling. The club even organised a day's training on Thruxton's skid-pan, and hosted a large presence at the Beaulieu 4x4 Show. JeepClub was arguably at its best when its members committed to its success, either through the organisation of events, contribution of new ideas, or the research of interesting off-road venues. Thanks to the efforts of an enthusiastic core, the 2003 calendar swelled with 26 events across the country. In some months, members could attend a JeepClub event every weekend if they chose to, and this success continued into 2004 and 2005. For all its success, there remained two challenges that JeepClub never successfully overcame - the issue of burn-out among event organisers, and the perennial problem of no-shows and non-attendance. The number of events in the calendar dropped to 17 in 2006, 11 in 2007 and just 7 in 2008. Despite the best efforts of one member in particular (a commitment that saw 14 events in 2009), by 2010 membership had dropped to just 130 - an eleven year low - with only five events run that year. On 18th June 2011, the club's original founder unveiled a plan to relaunch the club. The plan called for the scrapping of the membership fee making the club free to access for all, a new website focused around an off-the-shelf discussion forum, and the desire to encourage and support members to organise their own events, harking back to the club's heyday. The club relaunched in July, and in its first six months it attracted 1,000 new members. However, club membership carries with it a degree of responsibility, and while the relaunch attracted no shortage of interest, this failed to translate into the volunteering commitment required to sustain a club. Rather than continue as a club in name only - an arena already well served by a variety of forums - JeepClub closed on 8th March 2012, having attracted 1,359 members. Although judged on this JeepClub appears a failure, it left behind a legacy of raised expectations, taught hundreds of Jeep owners how to drive off-road, and cemented countless friendships, many of which still hold today. None of which would have been possible without the participation and enthusiasm of a community of people with a common interest - and to them, thank-you.